The Chicago Cubs used three wins over the San Diego Padres last month to create some distance between themselves and the rest of the National League Central Division. Now locked into a fierce fight to hold off the rest of the field as they settle into August, the Cubs hope they can do the same when the Padres visit Wrigley Field for a four-game series starting on Thursday. Chicago faces the struggling Padres fresh off a 9-2 victory over the Pittsburgh Pirates on Wednesday in newly acquired Cole Hamels' debut with his new team. [post_ads]Hamels, who didn't allow an earned run and struck out nine over five innings against the Pirates, adds to a starting rotation that is still without Yu Darvish. The Cubs announced on Wednesday that Darvish will throw a two-inning simulated game on Saturday before he will head out on a minor league rehabilitation start as he continues to deal with a triceps injury. 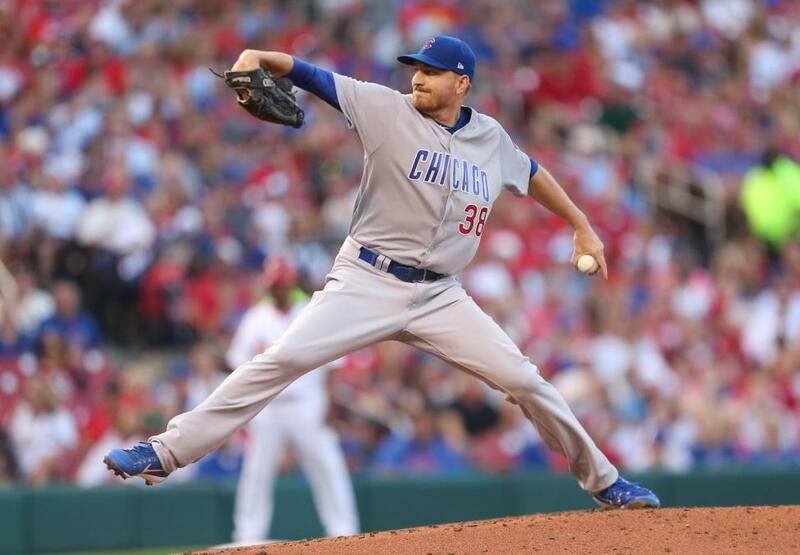 Mike Montgomery (3-4, 4.03 ERA) will start on Thursday and hopes to bounce back from a rough outing in his last start. Montgomery allowed 12 hits in five innings in a loss last weekend to the St. Louis Cardinals. Montgomery remained in the starting rotation after Hamels' acquisition sent former starter Tyler Chatwood to the bullpen. The Cubs will have another decision to make once Darvish returns, but for now Montgomery wants to contribute what he can. "They haven't talked to me about (innings)," Montgomery said recently, according to the Chicago Tribune. "I don't want to worry about that. I want to worry about making sure my mechanics are good and I'm making my pitches. "I know (the concern) is out there. And we have another eight to nine weeks for the rest of the season. I want to pitch, get out there, throw innings, just be involved." Montgomery is 2-0 with a 1.65 ERA in four career appearances (two starts) against San Diego. The Padres enter Thursday's series opener having lost seven straight games. Following an extra-inning 3-2 loss to the San Francisco Giants, San Diego finished July with a 5-20 record, which represents the second-worst month-long stretch in franchise history. San Diego was swept by the Cubs last month entering the All-Star break and things haven't improved much for the Padres since. Manager Andy Green told reporters following Tuesday's loss that while starting pitching has been an issue at times this season, the Padres' lack of offensive production has become more problematic. "It's the quality of the at-bats," Green told reporters, according to the team's official website. "We just can't string together quality at-bats. That's been tough for us." San Diego's current skid hasn't helped matters. "Probably the hardest thing for us has been flushing previous days and not letting that carry-over effect, that hangover effect, not getting it done, impact the next day's at-bats," Green said. "As professionals at this level, we need to do a better job of flushing that, and showing up the next day with the expectation that we're going to be successful and win a baseball game." Robbie Erlin (1-3, 3.47) will pitch Thursday's series opener in just his third start of the season. Erlin will replace right-hander Luis Perdoma in the starting rotation after Perdoma was placed on the disabled list with a shoulder strain. Erlin, who has not faced the Cubs as a starter in his career, will make his first start since May 21.